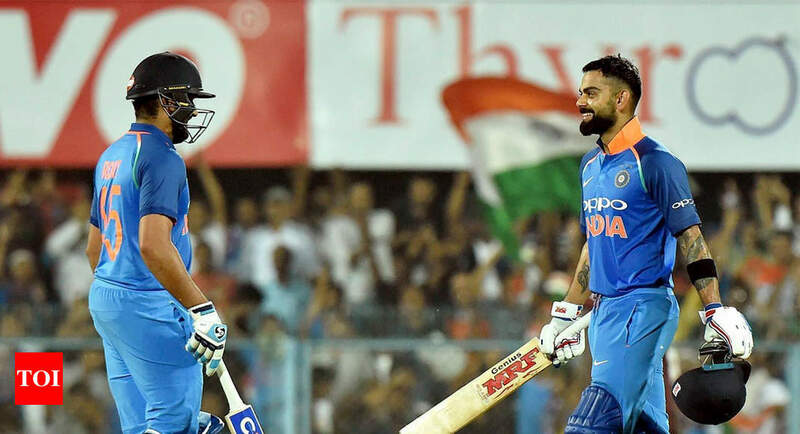 Times of India – GUWAHATI: India captain Virat Kohli on Sunday hailed his deputy Rohit Sharma for his superlative batting display, saying it is easy to chase down any target when the Mumbai batsman is at the other end. GUWAHATI: India captain Virat Kohli on Sunday hailed his deputy Rohit Sharma for his superlative batting display, saying it is easy to chase down any target when the Mumbai batsman is at the other end. “Among the top three, I mostly take the anchor role because both Rohit and Shikhar (Dhawan) are good stroke-makers,” he said.Kohli was adjudged man-of-the-match for his 107-ball knock and the India skipper said he enjoyed his batting today. “It was one of those days where I felt good and I told Rohit I will continue to bat this way positively and maybe you can play the anchor role,” he said.Kohli said building partnerships is the key to success in ODI cricket. “It’s our 5th or 6th double-century partnership, it’s a pleasure to bat with him (Rohit). That is something to learn for us,” Kohli said.